I recently spoke to Rio Products’s line designer, Simon Gawesworth, who’s best known for his spey casting prowess (but who is also partly responsible for Rio’s technological surge over the past few years.) I asked Simon about the differences between tippet offered as “IGFA” tippet and the stuff marketed as just plain-old tippet. He explained that consistent break strength and consistent diameter are really separate things a manufacturer must control. Because tippet is formed from a hot, extrudable liquid, after all, it’s not that surprising to learn that low-end tippet may not actually be the rated diameter (say, .006 inches for 5X, a trout standard), at least not consistently. Some of it may droop or extrude too thickly, or it may not cool consistently, etc. Thus, a diameter of .006 inches, Simon explained, would be more of an average the manufacturer would shoot for (this is especially true of lines manufactured for the spinning-reel market). The more expensive the tippet, the tighter the manufacturing controls (and the better the raw materials) and thus the more consistent the result. So, IGFA-branded tippet has been specially manufactured to control for break strength above all else. Simon acknowledged that this doesn’t mean the rated diameter is likely to be wrong, just that the focus is especially keen on the advertised break strength (which is actually lower than most non-IGFA tippet). 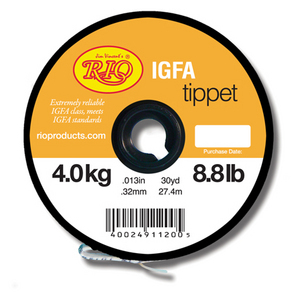 For example, the IGFA tippet pictured above has a break strength of 8.8 lb. for a diameter of .013 inches. Rio’s RioMAX brand saltwater tippet, meanwhile, has a different plastic formulation and thus has a break strength of 15 lb. for the same diameter! Or, for a trout example, take Rio’s “Powerflex” 5X model: at .006, it has a 5 lb. break strength. Now compare that to Rio’s “Extreme” 5X model, which is also .006 inches thick, but has a whopping 10 lb. break strength! So, if you’re looking to catch the biggest fish possible on the lightest possible tippet, and you need to know you can rely on the rated break strength, then by all means buy IGFA tippet. But if your goal is simply to buy the strongest tippet you can for a given line diameter, go with a different product. The takeaway here is to always look closely at the break strength-to-diameter ratio on the spool (and also, to remember that the more expensive the spool, the more likely those numbers are to be accurate). Have questions for the manufacturers about the bewildering array of tippet available these days? Let us know in the Comments section, and we’ll try to get them answered. Primitive Fly Fishing - With Kites?